Once the project was achieved, Peugeot produced 28 C28 running prototypes which had to be tested in difficult conditions. Peugeot tested first some prototypes on their own privates circuits, in Bellechamps, near Sochaux, and in Mortefontaine, in the North of Paris. Six missions abroad were organized among which one in Ivory Coast and another one in Finland. The mission in Ivory Coast had the purpose to test the ventilation system as well as the dusttightness of the body. The prototype is carely wrapped and is enclosed in a large container and then sent in the country via a Boeing 747 cargo plane which landed in Abidjan. The shipping costs were £50,000. Once arrived in Abidjan, the prototype was driven up north, far from the city and in calm places in order not to be seen. It was equipped with thermometric soundings on the passenger side and with a computer placed in the boot and which goal is to record data. It is important to test vehicles and the private circuits of car makers cannot reproduce the real-life situations which the customer will face. Prototypes are thus always tested in difficult conditions which are also called “extreme conditions” in both hot and cold countries. But let’s go back to our story. 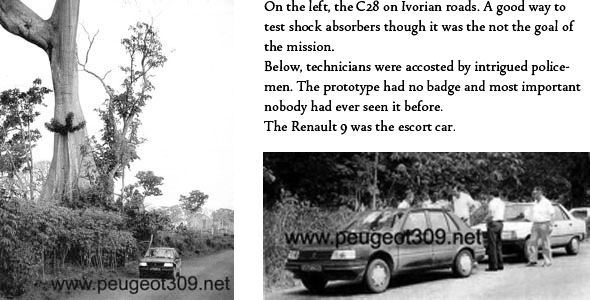 Peugeot ingeneers were in Ivory Coast to test the C28 prototype, which, let’s me remind you, cost more than £600,000 per unit! The prototype was driven through the country with on its bord a special equipment which records data. But even if the car was thousand of miles away from France, it was not invisible. And one day, ingeneers were stopped by two policemen who asked questions about the vehicle they had never seen so far. But ingeneers always know how to deal with that, and finally, they answered the vehicle was from another country. Actually, ingeneers always tell the same story, and some years before, during the 205 tests in the Sahara, the prototype had a badge with Cyrillic letters. For the ventilation tests, the car was depressurized with a rear window slightly opened, and thermometric soundings were placed to different places of the interior. The main problem of the ventilation system is the noise it produces, even if ingeneers made the effort to eliminate some decibels from mechanical and aerodynamic origins. Concerning the dusttightness tests, the contrary is done, ie not a single window is opened to create an overpressure an overpressure. Tests are good except from the hatch which seals are not that useful. The vehicle was driven, again and again, and ingeneers noted that the suspensions were quite efficient on bad roads. At the same time, a prototype was in Kenya in order to test the suspensions. Most of the time, four people were inside the vehicle and another car, which was rented there, followed them. Tests were convincing and the car was sent back to France. Another C28 prototype was sent to the frozen North, in Finland, facing the Arctic cold of the Finnmark. The car was sent by plane to its final destination, Ivalo, a small town of Finland. In the ton, there was only one hotel and Peugeot ingeneers met various ingeneers testing other vehicles. 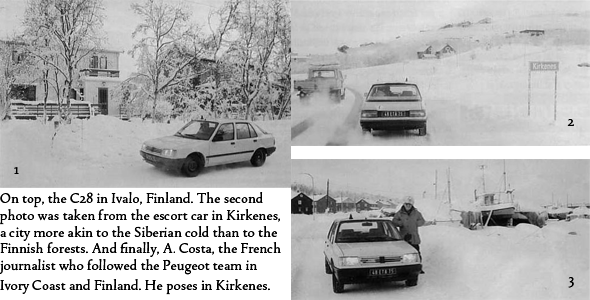 During their time there, they met Volkswagen and Ford ingeneers who, by the way, informed them that someone was chasing prototypes with a Saab 9000 Turbo registered in Sweden. The prototype was parked in a garage not far from the hotel. Every morning, ingeneers came with a Volkswagen Jetta they had rented and which engine had been heated all night long with an independent heater plugged to the car, as it is usually the case there. The temperature can be as low as 50 degrees and even with an independent heating system, the engine had to be started 15 minutes before departure. On board of the C28, ingeneers drove hundreds of kilometers and crossed both the Norwegian and the Swedish borders. As it was the case in Ivory Coast, ingeneers tested the ventilation system and it seemed to perform well. Despite its cost, the vehicle was not really driven carefully and ingeneers drove it as fast as 120kmph (around 70mph) on snowy roads. The vehicle reacted well though. The vehicle was driven all day long and it went until Kirkenes, the last occidental town before the Russian border. They also saw the Norwegian military Arctic brigade training in tough conditions.